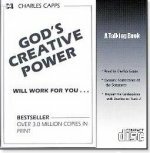 Description:Charles Capps has created an interactive CD from one of his best selling booklets, God's Creative Power will Work for You. (narrated book read by Charles Capps). 1-CD.